I am honored to be on staff with World Orphans as the Director of Wholistic Care as well as a member of River Oaks Community Church (ROCC) in Maryville, TN. ROCC partners together with Fountain of Hope Church (FOH) in Nairobi, Kenya where 24 orphaned and vulnerable children are being cared for spiritually, physically, emotionally, and mentally in the context of family and through church partnership. Precious Emily is part of a loving family now. I will never forget the first time I met her. She was painfully shy, withdrawn and fearful. It was clear that the damaging affects of horrid physical abuse and grave neglect had impacted her ability to make simple eye contact, connect with others or feel safe. Children who have escaped this degree of trauma are deeply needful of special attention, patient love, and persistent care. The trauma inflicted upon Emily caused deep wounds that seemed irreversible and impenetrable. No child should have to experience such hardship, yet this is the plight of millions of children around the world. It causes me to cry out, “But, God!” And I’m reminded that God’s eye is certainly upon them. Psalm 10:17 - O Lord, you hear the desire of the afflicted; you will strengthen their heart; you will incline your ear. World Orphans is committed to the needs and care of orphans through the church and to the wholistic care of children in families. It has been the love of FOH and their joyful partnership with ROCC that has actedto penetrate and crack through the devastating effects of abandonment and trauma. 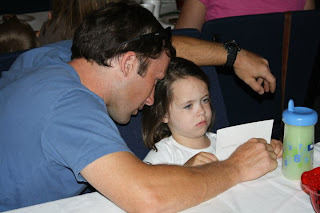 The love of Christ through the church has opened wide the door for children like Emily to belong to a family and experience the beautiful care of a spiritual mother and father along with others who participate in Emily’s continued healing and restoration. I am preparing to lead another team from ROCC back to FOH where together, we will worship, pray, share meals, proclaim the Gospel, host a medical camp for the community, visit orphans and widows in their distress, and deepen the bonds of our friendship together. This is ROCC’s 5th partnership trip with FOH and there is great anticipation as we prepare our hearts to serve the community alongside each other in July. One of the first faces I will look for when I to return to Kenya is Emily's. Caring for children like Emily is not simply pointing her 'towards heaven' but witnessing year after year, ‘heaven coming down' to her through the love of the church and the bond of family. This is a profound and miraculous act of God’s grace. Colossians 1:18-20 - And he is the head of the body, the church. He is the beginning, the firstborn from the dead, that in everything he might be preeminent. For in him all the fullness of God was pleased to dwell, and through him to reconcile to himself all things, whether on earth or in heaven, making peace by the blood of his cross. World Orphans wholistic care of orphaned and vulnerable children is rooted in the reality that lasting transformation for the deepest physical and spiritual needs are found in the hope of Jesus. It was in the sacrificial and lovingactof Jesus' death upon the cross and God’s power that raised Him from the dead that inaugurated forgiveness of sin and the hope of lasting restoration for those who believe. The Gospel was a historical event of Christ's death and resurrection and this redeeming love continues to act upon the plight of precious children like Emily. Emily’s needs are being met physically. She doesn’t miss a day without eating and is receiving the nutrition she needs to grow. Emily is maturing in her relationship with Jesus and spends regular time in prayer. She attends a small private school where there is provision of tutoring and the extra help she needs to progress academically. Emily is receiving emotional attention and counseling in an effort to help her process her past and find healing for her broken heart. Wholistic care enacted through the church is when eyes meet eyes, hands meet hands, wounded hearts heal, and trust is established through the context of loving relationship. Wholistic care is when the body of Christacts to serve vulnerable children spiritually, physically, emotionally, and mentally. It is in the act of loving someone and reaching into a broken heart that I see the face of God. How do you see the face of God in your life? 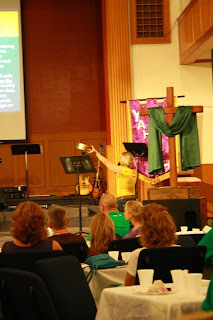 What are you then compelled to do as a responsive action of love and faith? We'd love to hear your thoughts. 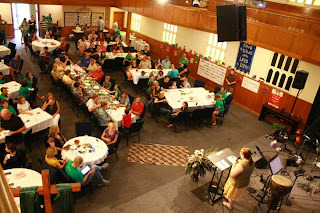 On August 8th, River Oaks Community Church celebrated their second annual 'Night of Hope' coffee house. Complete with the aroma of freshly brewed coffee and delicious desserts, the body gathered together to see pictures and hear stories about our most recent Church to Church trip to Fountain of Hope in Kenya. This was a tender family night of worship and sharing. We heard from those who went to Nairobi about all that the Lord is doing through the ministries of our church partner. We are blessed to partner with Fountain of Hope as we seek to plead the cause of the orphan, strengthen the local indigenous church, and impact the community side by side for the sake of the Gospel of Jesus Christ. 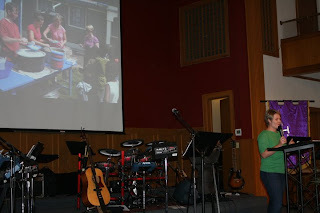 Lindsey, a team member, shares about Fountain of Hope's Saturday Feeding Program. Fountain of Hope opens their gates every Saturday to the hungry children living in the surrounding slums. A father introuduces his daughter to the orphaned children through our team picture. We talked about the significance of prayer in our partnership. The purpose of the evening was to rejoice at what God is doing through our Church to Church partnership and deepen the body's commitment in our work with Fountain of Hope. Fountain of Hope Church in Nairobi, Kenya recently opened a small medical clinic and tailoring school on the church property. The tailoring school has six sewing machines which will be used to teach women basic tailoring skills so that they can help provide income for their families. The clinic and school are just another example of the church being active in their community and showing the love of Christ by caring for physical needs. One of the primary ways that World Orphans cares for the plight of the widow and orphan is through our Church-to-Church partnerships. River Oaks Community Church in Tennessee just returned from Nairobi, Kenya having spent 9 days serving alongside our church partner, Fountain of Hope. One of the most meaningful ways that we participate together during our trips is to help host and sponsor a 2-day free medical camp for the surrounding slum areas. This year we prayed for and treated over 400 people. When Fountain of Hope opens their gates to the slum community for medical care, they are also opening the gateway to hearts that are desperate and longing for hope. Many are crushed under the yoke of oppression and poverty, struggling to work out how they might survive another day. This time last year we prayed for a young woman named Jesente. I remember her well. She brought several small children with her and came in deeply discouraged. Her circumstances had resulted in a downward spiral where she was ready to end her life. She was literally about to collapse under the yoke of oppression and potential suicide. This memory stands out to me because she kept dragging her finger across her throat, saying “I’m done; I just want to die”. We prayed for her, treated her medical condition and I noticed that she continued to stay around as we ministered to others. She asked me to take her picture and her beautiful face was etched on my heart as I returned home. I would not know what her future held, but I was assured of the greatness and mercy of God to bring help and hope to this dear young woman. Half way through the first day of medical camp this year, Jesente returned through the gates of Fountain of Hope. She recognized me from last year, ran across the room, threw her arms around my neck, and exclaimed ‘I’m alive, I’m alive; because of your prayers for me last year, I’m alive’!!! We sat down with her and inquired about how she was doing. Although her circumstances still remain difficult, this would be the year that she would believe and surrender her heart to Jesus Christ, receiving His free gift of salvation. God’s mercy and kindness led Jesente back to Fountain of Hope’s medical camp, where this time, she would find eternal healing for her soul through the finished work of Jesus Christ. What an inexpressible joy to partner with Fountain of Hope and participate alongside the meaningful ways that they are living out the Gospel of Christ and serving the community in their deepest places of need. "For we do not want you to become ignorant, brothers, of the affliction we have experienced. For we were so utterly burdened beyond our strength that we despaired of life itself. Indeed, we felt that we had received the sentence of death. But that was to make us rely not on ourselves but on God who raises the dead. He delivered us from such a deadly peril, and he will deliver us. On him we have set our hope that he will deliver us again. You also must help us by prayer, so that many will give thanks on our behalf for the blessing granted us through the prayers of many." The Church… isn’t she beautiful! Earlier this year I visited one of our church partners in Juja, Kenya with a team from Northpoint Church in Austin. As our team arrived we soon found ourselves drenched in the beauty and fragrance of the Church loving, caring and empowering their city. Day 1 we began to organize games and sports that would allow us to easily interact with the kids and be able to pour out love, attention and a bit of craziness that all kids need. The church we were visiting was Fountain of Life, Juja lead by Pastor James and his precious wife Teresa. We quickly realized this place was the local hot spot of the city for kids. As we shared the message of Jesus through games, dance and fun, we were lost in the reality that something special was happening among us, God was up to something. Most of these kids were orphaned due to poverty or HIV Aids, yet nothing but smiles and dancing. One big party and everybody seemed to be invited. Fountain of Life Church had beautifully engaged these kids with love, compassion and the desire to see these precious kids placed in a family. As we looked around we saw something else that was beautiful, open doors to the church, open doors to the kids home and little kids with baggy pants and dirty feet, dancing from a balcony just beyond the fenced wall at the back of the property. So much life, so much hope, so much love… the Church… isn’t she beautiful! In March 2007 our team was in Nairobi, Kenya visiting several projects. During that trip our leaders went out into the Mathare slums with Fountain of Life, one of our church partners, on their home visits. It was there that we first met Mary. Last week our in country director let us know that Grandma Mary Wanini passed away. She leaves behind her 8 year old granddaughter, Eunice. "Mary was a kind and gentle woman, with much love and hospitality for anyone who met her," said Mark Gumm, regional director of advocacy who met Mary on several occasions. Mary and Eunice serve as a good example of World Orphans model of Continuum of Care. Over the last 3 years Pastor Gideon's church has been engaged with Mary and Eunice during their regular home visits, ensuring their basic needs are met and that Eunice is able to go to school. Now that Mary has passed away the church is able to make sure that Eunice is being cared for by her Aunt. Pastor Gideon also reports that through the generosity of church members and others, Mary's funeral expenses have been covered. While we mourn the loss of Mary we rejoice knowing she is with her Savior and that Eunice has not been orphaned but is being cared for by her Aunt and by the church. We kicked off our new C2C partnership with Fountain of Hope last week by providing a coffee house at River Oaks Community Church in Maryville, Tenn. It was a delightful and special evening!As people entered into our time together, they came through and experienced a typical home visit in the slums of Kicheko in Nairobi, Kenya. It was family night at River Oaks, complete with children sitting on blankets on the floor, small groups seated together, and the aroma of freshly brewed coffee filling the air. the partnership will unfold between our two churches over the next five years. We ended with suggested ways of contributing to this great cause by as simple an idea as one less pumpkin spice latte from Starbucks a week. We realize that the smallest sacrifice will grant school fees and basic care for one of the children. Most importantly, we prayed, asking that by the power of the Holy Spirit, we would be gripped by God to consider the rescue of the orphan as we do this one child, one church, and one community at a time through our new partnership with FOH. After sending a group to a WO home in Kenya, River Oaks Community Church in Maryville, Tenn. is taking their support a step further. Since their partnership with Fountain of Hope church in Nairobi, Kenya is relatively new, the church is hosting an entire evening dedicated to educating the congregation about the partnership and raising funds to support the project. "Join us in hearing about our new partnership/relationship with Fountain of Hope in Nairobi, Kenya this Sunday night. It's going to be a sweet time in the Lord! 'Disciple making is not about a program or an event but about a relationship'-Radical-David Platt," wrote Kathy Davis, River Oaks member and WO staffer. The evening will have a coffee-house feel and will include interactive exhibits about slum-life in Africa and stories about the summer trip to Kenya. 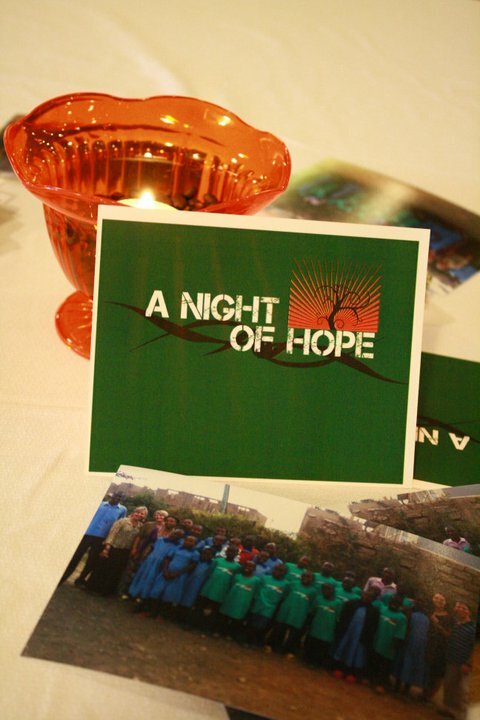 "Team 1:27 of River Oaks invites you to A Night of Hope. Join us as we see & hear amazing stories of 16 kids in Kenya. Enjoy coffee & dessert with us & be given the opportunity to share hope & love. Dessert & coffee served at 5:30pm with the time of sharing at 6:00pm," according to a public facebook invite. On Tuesday, August 17th, nearly a dozen women gathered in their friends home for a Silpada Jewelry show with representative Kym Erickson. What made this show unique was that Erickson donated her profits to World Orphans. About a dozen women gathered in the home of Tara Webb in Grand Rapids, Mich. As part of Erickson's presentation World Orphans Advocate Randy Phillips was able to talk about his recent trip to Kenya and share the story of one family he met on his journey that especially touched his life. The guests then had time to peruse the jewelry and place orders through Erickson. Not only was it a fun night but approximately $200 was raised and one of the guests signed up to host her own fundraiser party. The hostess can choose which World Orphans project she wants her party funds to go toward. "It gives me a purpose to be able to help those who have so little when we here have so much," said Erickson. "I'm bringing joy to women here in America by making them look pretty and feel good about themselves while enjoying a night out from the hustle and bustle of everyday life. With a small purchase of jewelry they can help out with medication, education, and food for a family." Host Tara Webb, Randy Phillips, Jen Phillips and Silpada Rep Kym Erickson stand in front of the jewelry display at Tara's home. Erickson is a great example of how advocates can use their existing business and/or hobbies to support the orphan and the widow.